Hello everyone. This is my first post. I have not officially applied to be a developer but I have been wanting to get involved with toying with the game mechanics of OpenMW for some possible post 1.0 feature adds. I have little to no experience in game engine programming but I know my way around c++ for large code bases as I help maintain a large micro-architectural CPU simulator at my job. I have added a very simple modification to camera.cpp/camera.hpp to support over the shoulder third person camera. 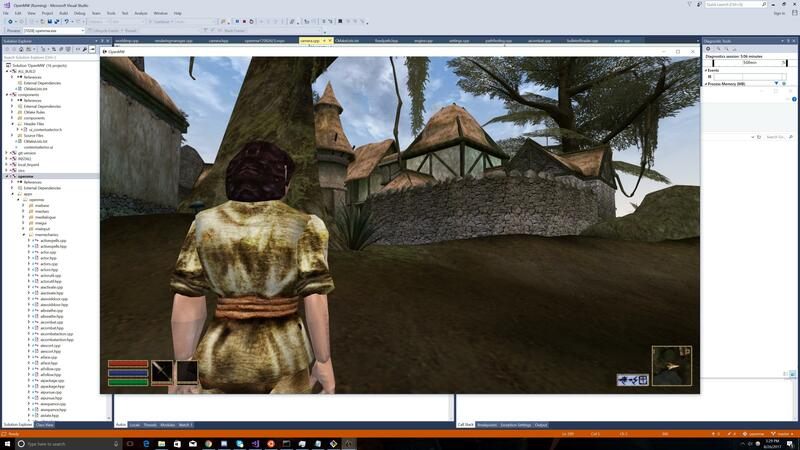 It seems to work pretty well but I have not tested all view changing states that may be options in Morrowind. Basically, as of now, you can keep pressing tab to cycle through first person, third person, and third person over the shoulder. 1. 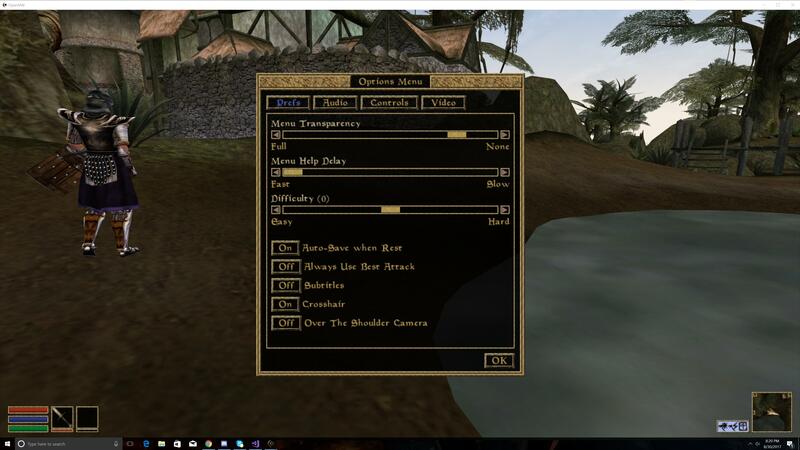 Is the team ok with adding these sort of modifications as options to OpenMW even though they are non-vanilla at this point? 2. How would one add these sort of game mechanic options without breaking the vanilla experience (set in the config file, enable in a game menu, etc.)? 2. Is there a way to get a more experienced graphics coder to review my changesets until i know what i'm doing? 1. I would see this more as a post-1.0 feature, but I also don't see it causing any problems besides maybe missing localised labels. Therefore I won't veto it. 2. For the time being it would be best to offer this as an alternative mode for 3rd person. In other words add an option to the user settings file that selects between conventional 3rd person and the over the shoulder version. I guess we could get away with not adding this option to the settings GUI for now, which would also eliminate the issue of localised labels. 3. Push it to github, then start a pull request to initiate the review. Completely showing my ignorance here. Can you elaborate on "localized labels" ? Would this be the new config option for it? Ok so I'll revert the cycling option and add a new variable as something like mActiveThirdPersonView. This will contain a value from the current active view enum whose options are: (FirstPerson, ThirdPerson, ThirdPersonOverTheShoulder). I may also add a left and right ThirdPersonOverTheShoulder if people want the option. I'll have to reverse engineer the portion of code for adding GUI elements but the code base is fairly organized so shouldn't take too long. I'll post updated screenshots. Will do after I make the necessary modifications. Ok so I'll revert the cycling option and add a new variable as something like mActiveThirdPersonView. I ask that you keep that TAB cycling option because combined with the Third Person Zoom the result would be fantastic. Mode 0 - Always display crosshair in third person mode. Mode 2 - Display only when a ranged weapon is readied”. I'll keep the tab cycling when the configuration is enabled then. Also, thanks for pointing out the mouse scroll support. Didn't realize it was there so I'll make sure this mode is friendly with it. This feature will have to be on the next pass for me but seems doable. For now i'll get over the shoulder in the source and then i'll look into these options. In the settings GUI, if you add a new option you will have to add a label to it that describes what the option does. These labels need to be localisable (not sure if that is actually a word). Currently we do not have a mechanism in place to do that (post 1.0 feature). So now it cycles by tab like vanilla when third person over shoulder is disabled. Otherwise, it will cycle first, third person vanilla, and over the shoulder third person. I decided not to enable mouse wheel distance changes with third person over shoulder since the effect moving away from the camera looked strange when the player is shifted to the left for over the shoulder. Is this placement for the option ok? Pull request is now available. So now it cycles by tab like vanilla when third person over shoulder is disabled. Otherwise, it will cycle first, third person vanilla, and over the shoulder third person. You can't add it to the in-game UI because there's no localization for it (it's the wrong language for someone playing the German version, for example).